Paris > At 6.30pm on Friday 5 May in the Cathedral of Saint-Louis des Invalides, there will be a mass in memory of Napoleon I and of the soldiers who died for France, in the presence of HIH the Prince Napoleon. (Mass open to the public, subject to availability). 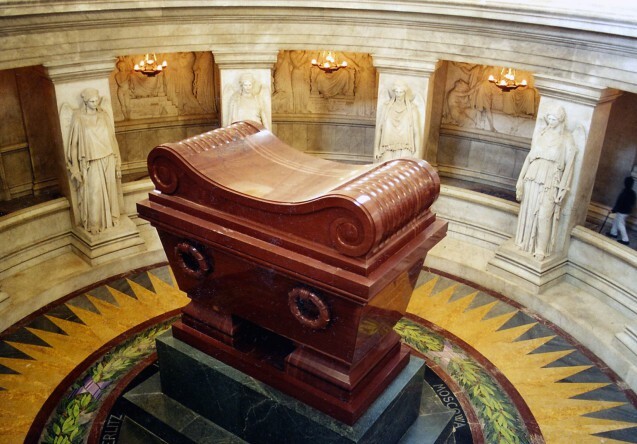 Earlier, at 6pm, in the crypt of the adjacent Dome Church, memorial wreaths will be laid at Napoleon’s tomb on behalf of the Maison Imperial, the Fondation Napoléon, the Souvenir Napoléonien, and the Ajaccians of Paris (by invitation only). St Helena > On Sunday 7 May at 12 noon, there will be ceremony at the tomb (where Napoleon’s funeral took place on 9 May 1821). It will start with a reading of a poem by Lord Byron, followed by the “last call”. After a one minute silence, wreaths will be laid on behalf of the French Consul, and of the island of St Helena (represented by the acting Governor) and on behalf of the Fondation Napoléon. The choir will sing the French National Anthem, after which the public will be invited to enter the area surrounding the tomb. Exceptionally, Longwood House will be open (free entrance) on 7 May from 1-4pm.